Boutique hotels are becoming a preferred accommodation choice for travelers. They offer high-quality customer service with all of the amenities needed for a truly relaxing stay. Book a stay at one of these boutique hotels in the Indianapolis, Indiana area. 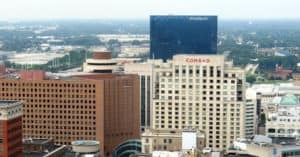 The Conrad Indianapolis is an elegant hotel that features luxurious suite rooms. Each suite in the Conrad is dedicated to a specific art genre. You can also find pieces from Salvador Dali, Pablo Picasso, and Andy Warhol in the hotel lobby. Each room is designed with optimal comfort in mind and includes a 42-inch LED TV, reliable Wi-Fi connectivity, and a pillow designed for your sleep style from the Pillow Menu. This boutique hotel is within walking distance to many of the best entertainment attractions in the city. Nestle Inn to this modern boutique bed and breakfast. The Nestle Inn takes the best parts of the traditional bed-and-breakfast experience and combines it into a modernly styled accommodation. The decor is eclectic and comfortable, and each guest will enjoy their own private bath space. Wake up in the mornings with a full coffee and tea service or a hot breakfast delivered to you from nearby Mass Ave. The Alexander is situated in the heart of the downtown Indianapolis center. The hotel aims to take hospitality to the next level with modern, comfortable guest rooms, on-site restaurants, and an art-infused interior. Each room comes stocked with a full mini-bar, coffee makers, and rain shower heads. There are three dining options on site to choose from. The reception desk is available 24 hours a day to improve your stay. The Iron Works Hotel is the relaxing environment you need after a long day. Whether you spend your time sightseeing the downtown city or attending business meetings, you will find the 19th-century-inspired rooms to be both comfortable and accommodating. Each room comes with luxury bedding, a full mini-bar, ultra HD smart TVs with cable, and a full line of luxury bath products. Are you celebrating a special occasion? You can make your stay extra romantic by arranging for strawberries, champagne, or gifts baskets to await your arrival. With the option to have room service deliver your dinner, you will never want to leave the comfort of your room. The Inn at the Villa is an intimate bed-and-breakfast that features old world elegance. The exterior includes stone trims, trefoil windows, and a grand entry that immerses you into the late 19th century. However, the rooms are updated with all of the conveniences and luxuries of today’s modern times. Every room comes equipped with a two-person Jacuzzi bath, a walk-in shower, and high-speed internet access. Enjoy the added amenities of the hotel which includes a fully stocked Butler’s Pantry and a private rooftop terrace. Any of these Indianapolis, Indiana, boutique hotels are sure to meet your lodging needs. Book a room today, and immerse yourself in the exciting culture of Indianapolis.